Hello beautiful people! As you know, beautystoredepot.com is all about getting the lowest price and the best advice on some of the greatest beauty and skincare products out there. I've learned quite a bit about skincare and beauty from my time at beautystoredepot.com and today I would love to share my top ten products with you. If you've spoken with me on the phone, there is a good chance that I've recommended this product to you. I'm in my late twenties and have struggled with adult acne since my late teens. This daily facial sunscreen is not only safe for sensitive and acne prone skin, but it also contains ingredients that address uneven skin tone, hyperpigmentation, and signs of aging. It's fragrance free, lightweight, and leaves no residue. I was introduced to this serum during one of my first product knowledge classes, where I expressed my skin concerns to our gloTherapeutics representative. This serum packs a triple threat! The retinol (vitamin A) addresses my sun damage and anti-aging needs, the glycolic acid helps exfoliate my skin and improve my skin texture, and the salicylic acid clears my pores and fights acne breakouts. I use it about three times a week at night before I go to bed. Vitamin C is a great antioxidant that brightens the skin, stimulates collagen production, and protects against environmental skin cell damage. This is unlike any Vitamin C serum I've used before. It's got a slick feel to it, glides on very smooth, and has a pleasant scent that I like to describe as "tropical". When I first used it, I was worried it would be too oily on my already oily skin, but after using it for a while I've noticed great improvements in my skin's tone and texture. Despite the bulkiness, I carry this mist with me almost everywhere I go. I use it in the morning to set my makeup and then spritz it on throughout the day as a refreshing hydrator. It's great for those hot summer days when you need a pick-me-up. Last weekend I even put it in my backpack to accompany me on a particularly warm, mid-day hike. It's main ingredients are citrus oils and fulvic acid. The citrus oils refresh the skin's appearance while the fulvic acid nourishes the skin with over 70 minerals and amino acids. Blush is fairly new to me. In fact, I had NEVER worn it until a few months ago. I'm now slowly building up a collection of blushes and perfecting the art. One thing I have noticed is that I get the most compliments on my skin when I am wearing "Spring Crush". It's a very soft, bronzed pink that gives just the slightest boost of color to my cheeks. Since Osmosis is first and foremost a skincare line, it feels as good as it looks and there are no harmful ingredients. I learned about gloMinerals from my esthetician about a year before working at beautystoredepot. I'd come in to see her with my face all caked up, trying to camouflage all my blemishes. My skin was very inflamed and my makeup at the time was only making it worse. She gave me a list of makeup that would benefit my skin, rather than just cover it up and irritate it further. This pressed base was one of the items on that list and I've been using it ever since. It's formulated with an exclusive blend of antioxidants including Vitamins A, C, E and Green Tea Extract to provide nutrients that are vital to maintaining the skin's healthy radiance. Along with my skincare regimen, it's made a drastic improvement on my skin's appearance and well-being. As I've mentioned previously, I'm acne prone. 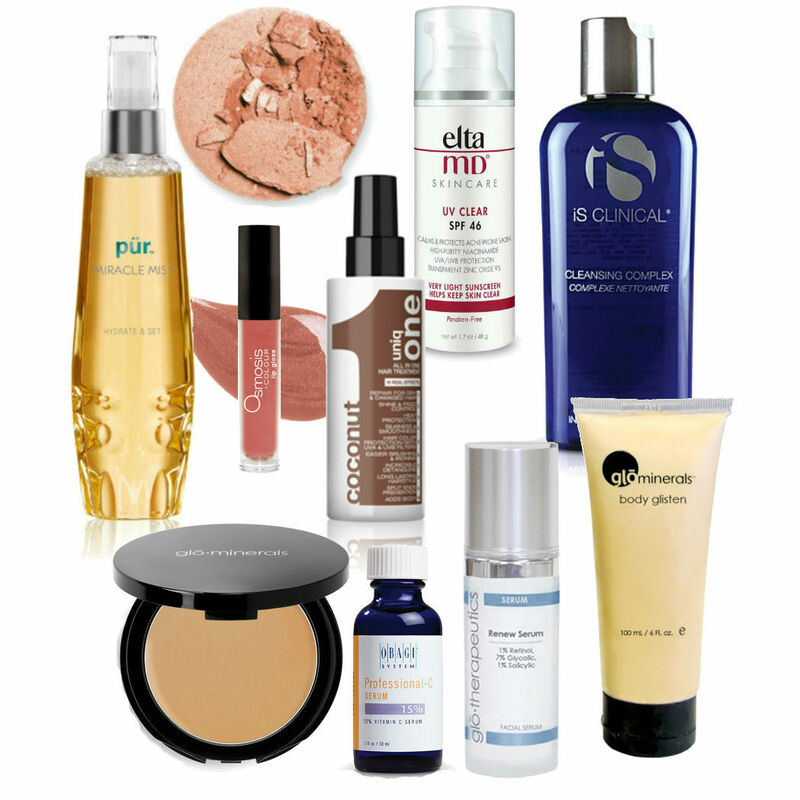 I am very particular when it comes to cleansers, because having clean skin is a huge part of keeping acne in check. I was very happy to find this cleansing gel because it is rich in healing and exfoliating ingredients like sugar cane extract, white willow bark extract and chamomile flower extract. I find this to be a highly effective cleanser that purifies and deeply cleans without stripping or drying my skin. Glitter. What can I say? I'm a sucker for glitter. Because of this, I have gloMinerals Body Glisten. It's a buildable shimmer lotion that contains natural ingredients that gently hydrate the skin while leaving a pleasant aroma behind. I use this pretty much daily on my legs. One thing that I will have to warn you about; if you don't wash your hands after application, you will have an insane amount of glitter on your palms. I'm a huge fan of the Osmosis Colour line. The ingredients are always well thought out and I think the colors are just fantastic! Lately I've been hooked on their "Bare" lip gloss. It's a beautiful shade that's high shine, yet still natural looking on my skin. One of the main ingredients is sunflower seed oil, which helps prevent moisture loss, promotes softer skin, and provides anti-inflammatory properties. I love the way this smells! I have a lot of wavy, thin hair that gets tangled very easily. I bought this product without knowing much about it, solely because it was coconut scented. After I started using it, I realized that it was so much more than just a delicious smelling detangler. It's called an "all-in-one" because it repairs damaged hair, adds shine, controls frizz, protects against styling heat, protects from UVA and UVB filters that can fade hair color, detangles, and prevents split ends. It's like a panacea for most hair troubles. I could go on, but I did promise to only brag about my ten favorites! Thank you so much for reading!